Too often we take for granted the waterways that flow through our cities and towns. Artist Laura Wills’ public art project Creek Lore actively addresses this neglect by engaging participants in a guided walk along a short stretch of First Creek in Adelaide’s leafy eastern suburbs to explore its health, history and usage. First Creek is one of five creeks fed by Adelaide Hills rainwater. With around 25 other people, on a sunny Saturday afternoon, I participate in one of the hour-long walks. Beginning at Marryatville High School through whose grounds First Creek runs, we stumble along the dry, rocky creek bed, duck under bridges, peer into the backyards of adjacent properties and hear several speakers discuss the creek’s environment, ownership and historical significance. There’s been little rain in May and the creek has not flowed for weeks, but last September, following a huge storm on top of a wet winter, creeks and rivers across the Adelaide plain flooded and First Creek was not spared the deluge. The first speaker, environmental lawyer Dr Peter Burdon, outlines the Indigenous law that governed the use of the creek prior to colonisation and the British-style law that has governed it since. The creek is no longer owned as a single entity and managed as a resource, as it was by the Kaurna people of the Adelaide plain, but is now controlled by various local government bodies and private owners of the land through which it runs. Fragmented ownership and control limits effective management and allows degradation of the ecosystem. Burdon notes that there are moves to recognise the legal rights of waterways to allow them to regenerate, citing New Zealand’s Whanganui River and India’s Ganges River which have been granted legal personhood. The question is how effective legal recognition of Australian waterways might be in improving waterway management and in recognising the traditional owners of the land, and how such recognition might work in practice. The second speaker, Marryatville High art teacher Maeve O’Hara, tells of students’ engagement with the creek, the local environment and the heritage-listed trees in the area. 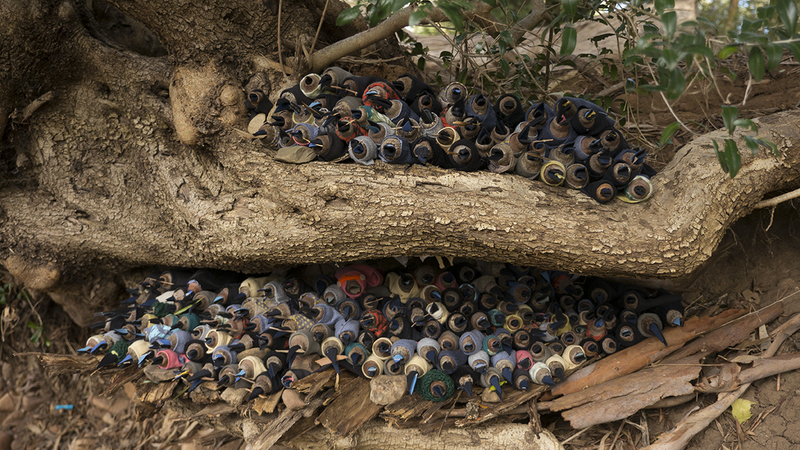 There is a communal bark-collecting project, and students make artworks on the theme of the creek and its environment. Sensitising students to ecological awareness will hopefully produce a generation better inclined to environmental management than mine has been. 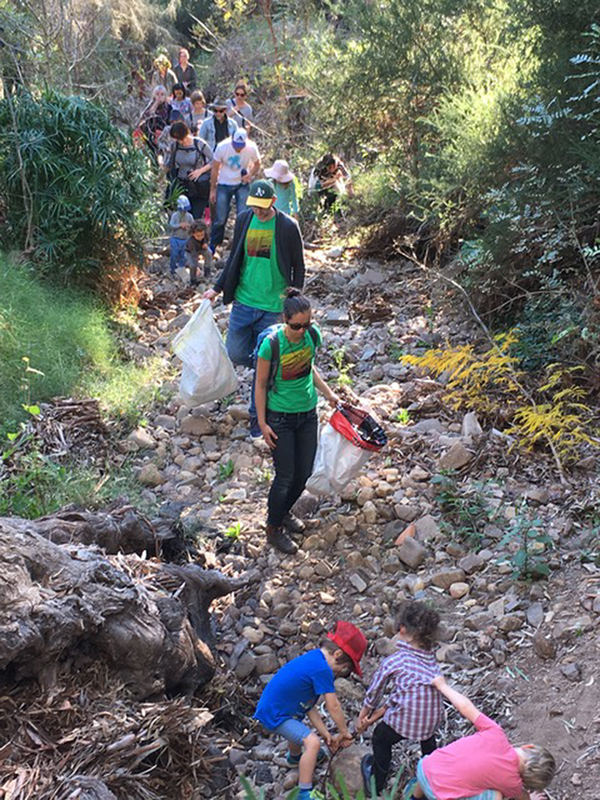 The Creek Lore guides encourage us to collect rubbish as we walk, and despite a similar walk and associated rubbish collection having taken place a week earlier, there is still more to be retrieved. Forager Kel Amity discusses local flora and displays a selection of edible and medicinal plants which can be found around the creek, including wild lettuce and rocket, nasturtium flowers and Moreton Bay figs. Further along the creek, Choral Grief, a community choir, give a performance, and we find ourselves in the backyard of Paula and Richard (surnames not provided), who describe changes to the creek over the 20 years they have lived there. They consider that the 2016 floods could have been mitigated by more frequent clearing of rubbish traps by local government and support the view that creek management should be reconsidered. Further along, Laura Wills speaks of her childhood near the creek and its history and describes 19th century records of Kaurna camps along its banks. 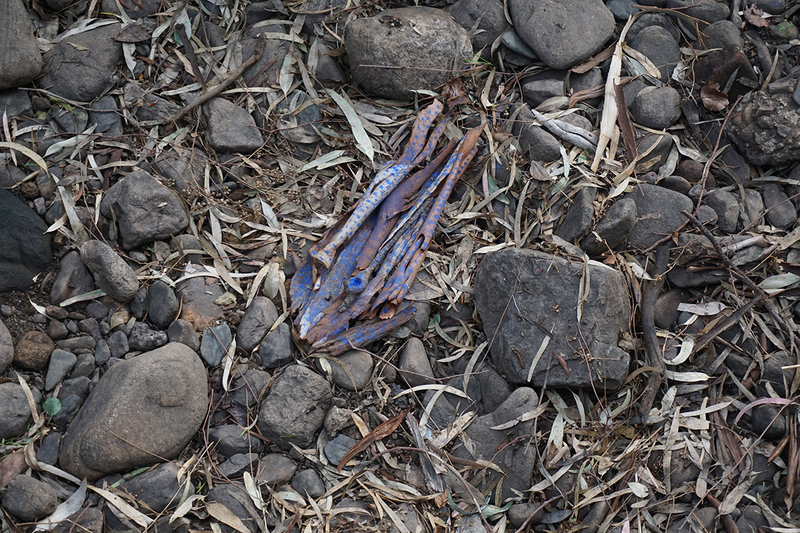 Wills has installed several evocative artworks along the creek bank, including Water, a digitised composite photo of the flooded creek printed on a large rectangle of cloth and suspended between two trees; baby birds assembled from cloth, knitted wool and gumnuts to draw attention to the loss of bird life; pieces of fabric embedded in the bank suggesting clothes and linen; and paintings on rocks lining the bank, depicting trees in the flooding rain and recalling Indigenous rock art. Participating artist William Cheeseman’s fish trap, a woven basket set into a rock barrier that funnels fish into it, shows how the original inhabitants sourced food. Our walk ends at the delightful Tusmore Park, with its barbecues, chlorinated wading pool and lush lawns amid ancient red gums. An old stone footbridge crosses the creek. There’s no trace of the 2016 flooding that inundated the park and filled the pool with mud. We’re directed to artist James Tylor’s simple installation — a metal plate fastened to a large rock in the creek bed stating, “do you know what happened here? you are standing on Kaurna country” — an unobtrusive but articulate reclamation of the site and its history. Tylor tells participants of Kaurna welcoming traditions and the process by which traditional culture and inhabitants were eradicated by colonists in the 19th century. Twenty-five years ago, I used to take my kids to this park but knew little of its history. At the walk’s conclusion, tea and cakes are served and artists, speakers, volunteer helpers and participants mingle. Laura Wills’ account of her relationship to the creek is a very personal one, as are those of James Tylor, who is of Kaurna as well as Maori and European descent, and Paula and Richard. There is a Creek Lore blog to which people have contributed. These personal accounts prompt us to think of our own connections to place, and this seems the real point of the relational Creek Lore project — to encourage us to reconnect to place and to neighbours. Wills worked with Open Space Community Arts (OSCA) to develop Creek Lore, which is subtitled a “project of the everyday,” one of a series of OSCA projects intended to encourage community engagement. First Creek is no longer an essential food and water source but a storm-water drain that sometimes clogs up. Community engagement has the potential to recognise the creek as an ecosystem and acknowledge traditional and current proprietors and users. Now that I’m more aware of the history of the area, I feel a greater sense of connection and responsibility. Practical steps beyond this project are unclear, but community engagement and activism at the local level can establish an important foundation in addressing broader social and environmental issues.